You've probably heard of the terms passive verbs and passive voice, but do you know what they mean? Do you know how they relate to active verbs and the active voice? You'll be relieved to know that you can understand the difference by asking just one simple question: Is the subject performing the action of the verb or receiving the action of the verb? In order to understand this concept, you need to understand subjects and action verbs. Subjects tell us whom or what a sentence is about. Mary sang. Action verbs show action. Mary sang. Note that this discussion doesn't include linking verbs. Why? They are not action verbs. 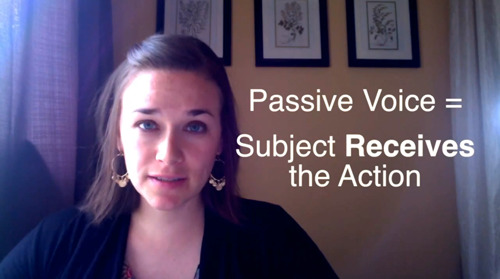 The topic of active and passive only relates to action verbs. Action verbs can be written in two different "voices." 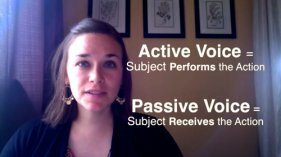 These voices tell us whether the subject is performing the action (active voice) or receiving the action (passive voice). When the subject of a sentence is performing the action of the verb, the sentence is written in the active voice. In the following examples, the subjects are underlined and the verbs are in bold. Notice that the subjects are performing the actions. My grandma made this scarf. The class took the test. The storm demolished many buildings. All of those sentences have active verbs. We can also say that they are in the active voice. When the subject of the sentence is receiving the action of the verb, the sentence is written in the passive voice. Look over the sentences below and notice that the subjects are not doing anything. They are not performing the action of the verb. They are the ones receiving the action. This scarf was made by my grandma. The test was taken by the class. Many buildings were demolished by the storm. All of those sentences have passive verbs. We can also say that they are written in the passive voice. It's Time For A Quiz! Let's see how much you know. The following quiz contains ten questions. Identify whether each sentence has a passive or active verb. Are you ready? Get started! How did it go? If you'd like to learn more about verbs, you might find these pages helpful. 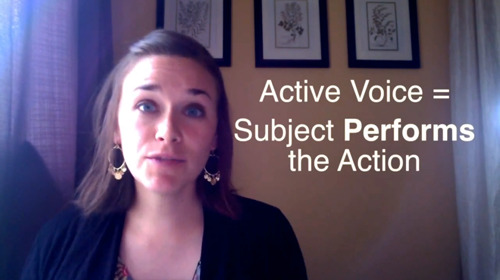 Should you use the active or passive voice? How do you diagram passive verbs? You can learn how to turn sentences from the passive voice to the active voice with the instructions and exercises in the PDF below. I hope you found this lesson helpful. Thank you for being here! I have gotten nearly all A's ever since I started following your lessons. Thank you.